This year, after being held for nearly 50 years in San Francisco, the American Geophysical Union (AGU) Fall Meeting was held New Orleans. This change gave me the unique opportunity to participate in a field trip, organized by AGU and led by Nathan Lott of the Water Collaborative of Greater New Orleans, to look at new infrastructure that is part of the city’s goal to increase resilience to hurricanes after the devastation of Katrina in 2005. The effects of Katrina can still be seen – as we drove away from the convention center, Nathan pointed out the still-abandoned Charity Hospital on the skyline and a shuttered school. On a personal note, my two mile walk from my Airbnb to the convention center passed several shuttered homes. But Nathan was quick to point out that flooding is not uncommon in the city (just this last summer, a power grid failure caused a pump failure that led to flooding in some regions) and our goal was to look at new resilience-oriented initiatives to address the problem (as a simple example, we passed a small WEFTEC service project bioswale next to city hall). Out first stop was a demonstration plot next to pump station #3 – one of the many pump stations within the city that move water from drainage canals to outfall canals and eventually to Lake Pontchartrain. After Katrina, the Water Collaborative began buying abandoned house lots and turning them into informational sites about the city’s relationship with water with demonstrations of resilient approaches to infrastructure improvements – like collecting rainwater runoff from a roof into a bioswale. Figure 1: (left) the canal bordering the demonstration plot which drains into (middle) pump station #3 and (left) part of the plot of land which will become the Mirabeau Water Garden. According to Nathan, the city is at a transition point; in the past, most efforts were local-scale, but now, the city is investing in large infrastructure projects. The most prominent is the Gentilly Resilience District and the centerpiece is the Mirabeau Water Garden, our second stop. Formerly the site of a convent, the 25 acres, which now look like a bare park, will be turned into a combined park and stormwater management site with a pump station, bioswales and a retaining basin. Our third stop was a new pump station, just three or four weeks from coming on-line, at the outlet of one of three outfall canals on Lake Pontchartrain. I learned on the tour that one reason Katrina was so devastating was that the pumps were not strong enough to pull water out of the city while withstanding at the same time storm surge from the lake caused by the wind. This new pump station can withstand up to 18 feet of storm surge while pumping water from the city, will be manned by crews 24/7 and can, in the case of an emergency, operate all five pumps continuously for five days. Once it comes online, the interim closure structure will be removed, as well as the upstream pumps within the city. Figure 2: at the new pumping station (topleft) the pump bay, (topright) part of the interim closure structures, (bottomleft) the generator bay, (bottomright) the debris gates. The city is completely located below sea level, and is enclosed by flood protection. I learned that early engineering to enable shipping into the city only increased its stormwater management problems. Because there are 90 river miles on the Mississippi between the city and the coast, Bayou St. John was expanded and dredged so that ships could enter via Lake Pontchartrain. Now however, ships have the technology to navigate the river, and the Bayou is simply another avenue for water to enter the city – so it has since been almost completely covered over. 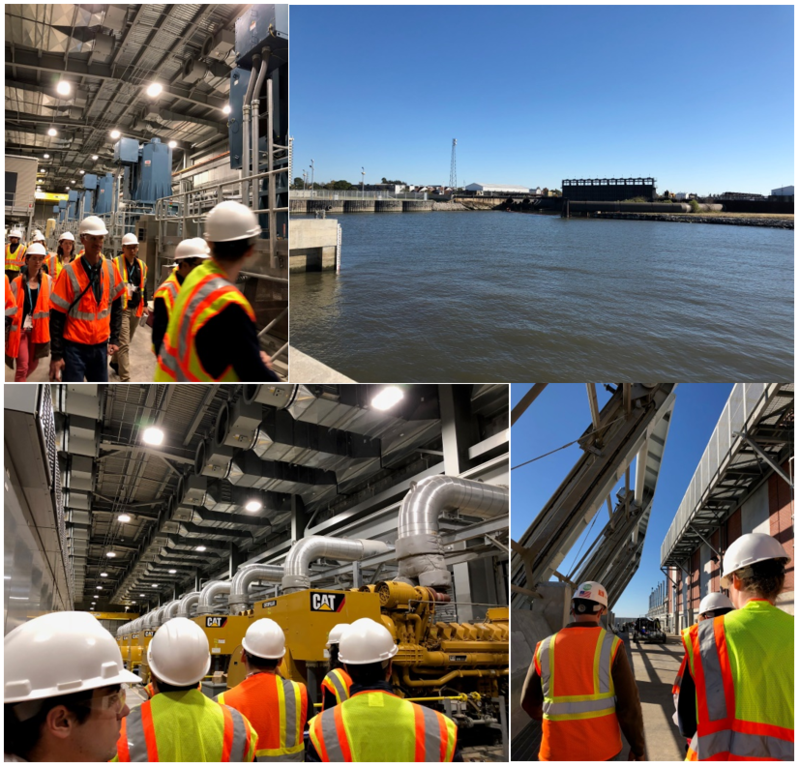 Our next stop was the IHNC-Lake Borgne Surge Barrier, where we toured the newly completed sector and barge gate and learned about the extensive work by the US Army Corps of Engineers and the Flood Protection Authority East to raise and armor the earthen levees around the city. 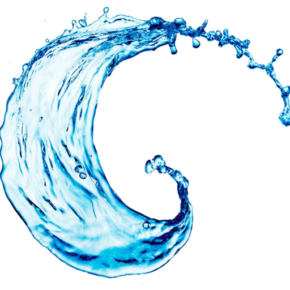 Raising the levees helps address the major concern of subsidence due to pumping and dewatering, natural soil compaction, and possibly, fault activity. Armoring the levees addresses another major concern of damage from overtopping. The barrier we visited is constructed at the location of a wall failure; the contrast between the old and new is dramatic. 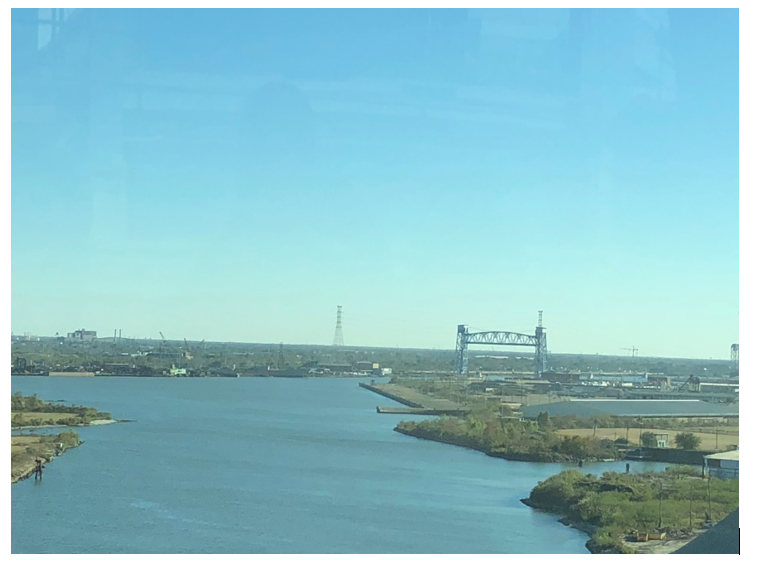 We could also see in the distance the Bayou Bienvenue vertical liftgate and we learned about the 100 and 200 feet deep pilings that make up some of the barrier. Figure 3: (left) on the sector gate looking northeast along the Intracoastal waterway away from the city – there is a barge at the tip of the gate entrance and the new wall is barely visible on the left side of the image, (middle) on the sector gate looking south towards the Bayou Bienvenue vertical liftgate which is on the horizon in the middle of the image, and (right) walking down from the sector gate where the old wall is on the left and the new and much taller wall is on the right. Our final stop was at Common Ground Relief, an aid organization located in the lower 9th ward only a few blocks from the levee failure on the Intracoastal canal. As the sun was setting, we gazed at the new homes (many built on stilts) while the head of the organization talked to us about their efforts to work within communities to create resilience, rather than come from the outside and impose ideas. Figure 4: One of the major canals within the city. As we headed back to the convention center, I felt like I had seen so much – from small scale local organizations to large US Army Corps of Engineers projects. I was encouraged by the ways New Orleans is working to improve resilience, but the next large storm will be the true test of their efforts.